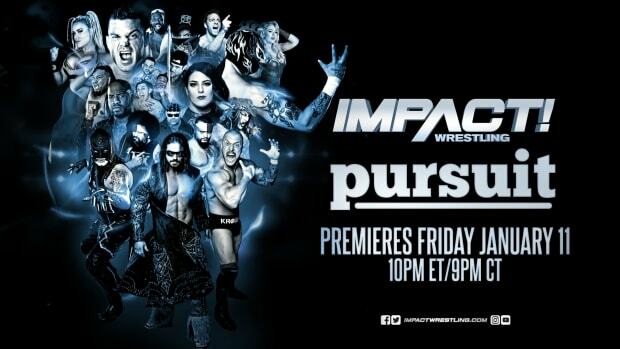 Impact Wrestling starts off with a video package showing The Hardys, The Wolves, and Team 3D. Those three teams will battle it tonight. It then switches to the Six Sides of Steel where Bobby Roode and Eric Young both dropped to the floor at the same time. Who goes after the TNA World Heavyweight Championship? The camera shows the Manhattan Center as the crowd is on their feet! They are ready! Music hits and here comes Kurt Angle! Kurt comes through the crowd in the balcony. He has a mic. He welcomes New York City to Impact Wrestling. He says it is his job to put on the best show he possibly can for all of us. Tonight he did not disappoint. Tonight there will be a grudge match between Ethan Carter III and Rhino. And for the main event it will be Team 3D vs. The Hardys vs. The Wolves. He then says he was suppose to congratulate the winner of the Six Sides of Steel match last week but Roode and Young both won. He will sit down with them though. He will let us know about later. Just then, music plays and here comes MVP and then Lashley and Kenny King are behind him. They walk down the ramp. They get in the ring and MVP grabs a mic. MVP asks Kurt if he said "fair". He says he lost respect for Kurt for pandering for the New York City fans. He then asks Kurt how the man in charge is as everyone thinks that they can book a match... especially when they have a phone and a 140 characters. MVP then starts to mock the New York City crowd. MVP continues and says this crowd has little dignity. And if gave out chokeholds, everyone will be down on their @ss. He says the King of New York is The Destroyer Lashley! Lashley steps forward and raises the TNA World Championship. Just then, Tommy Dreamer walks down the ramp with a microphone. He gets in the ring. He says MVP knows how he feels about him. He says MVP is one of the most underrated talents in wrestling. He then says Kenny King is a sell-out because he is from Queens. He is better than this. He turns to Lashley and says he has finally lived up to the potential he has. He has become the most dominate World Heavyweight Champion this or any company has ever seen through his handwork and sacrifices for this audience. He doesn&apos;t need to get cheap heat. Just then, King hits Dreamer from the side. Dreamer falls. King grabs him and tosses him to the outside. MVP gets back on the mic and tells Kurt he has this. Just then, Dreamer grabs a kendo stick, trips King, pulls him to the outside and tosses him away. Dreamer gets in and MVP continues to talk but Kurt tells him to shut up and says it should be Tommy Dreamer vs. Lashley in a New York City Street Fight. How about that Lashley? MVP talks up the game to Dreamer and, out of nowhere, Lashley attacks Dreamer. Dreamer falls. Lashley stomps on him and the bell sounds. King and MVP get in the ring. MVP grabs a kendo stick and raises it up while Lashley raises the belt. Madison Rayne is walking backstage. The camera man asks her about her match to determine the Number One Contender match for the Knockouts Championship. Madison says it will be great and while everyone is talking about Taryn Terrell and her return, which is great, but they will soon be talking about Madison Rayne. A video shows stating "Warning" and then "Havok is Coming Next Week". A video plays showing Samuel Shaw and Gunner in a hotel room. Shaw is drawing the New York City skyline while Gunner gets a text from one of his friends. Samuel thinks it is Ken but Gunner says that is water under the bridge. Gunner goes to get a drink while Shaw wants to stay there as he is really into his drawing. He then stands as Gunner leaves and goes up to Gunner&apos;s coat. They go after each other and there is a quick pin, but they quickly get up. Taryn goes for a pin but Rayne kicks out. Taryn does a headlock but Rayne sends her in the ropes. Taryn hits her coming back and then goes into the corner. Madison tries to come back as she whips Taryn into the ropes but Taryn holds on. She runs to Rayne and kicks her. Madison goes to the outside. Taryn goes on the apron and jumps but Madison moves and Taryn crashes and burns. Madison brings her in and covers. Taryn kicks out. Madison continues to attack her as she sends her in the ropes and then hits a dropkick. Taryn gets up and fights back. Madison quickly comes back and does a roll-up but Taryn kicks out. Both stand and punch back and forth. Madison locks her arms and does a northern light suplex. She has the bridge but Taryn kicks out. Both stand and continue to fight back and forth. Madison kicks Taryn right in the face and quickly covers but Taryn kicks out again. Madison puts Taryn on the top and climbs the corner but Terrell punches her away and then flies and hits Madison with a closeline. She then hits another closeline. And then another. She kicks Madison in the gut and hits a swinging neck breaker. She covers but Madison kicks out. Taryn climbs the corner. She jumps and hits the flying cross body. She covers but Rayne kicks out again. Bobby Roode is walking backstage and the camera man asks him about his tied win last week with Eric Young. Roode is fine with it and hopes for the best. He knocks on Kurt&apos;s office and enters. He sees Eric Young standing there. Roode is surprised and says whatever happens... Just then Kurt Angle enters the picture and says they need to talk and tells the camera man to turn the camera off. Gunner enters the hotel room again and he sees Samuel Shaw in his military uniform. Gunner asks what he is doing. Shaw gives the salute but Gunner tells him to take it off. Bobby Roode and Eric Young leave Kurt Angle&apos;s office. Kurt thanks them for agreeing. The camera man asks Kurt what the conclusion is and Kurt says it will be announced publicly next. A video plays showing the confrontation between Ethan Carter III and Rhino last week. Rhino is shown backstage. He says he can&apos;t forget what Ethan did to him last week... and he won&apos;t forget. He will beat Ethan up and take him out with the GORE, GORE, GORE! Bobby Roode is in the ring with a mic. He says he was with 5 other talent in the Six Sides of Steel. The winner would go and be the number one contender for the TNA World Championship. There was no real winner. He came from Kurt Angle&apos;s match and says there will be another number one contender match and it will happen next week. It will be Bobby Roode vs. Eric Young. Roode calls EY down. Young&apos;s music hits and he comes out on the stage. He gets in the ring and Roode says, "You&apos;re crazy!" The crowd chants, "EY, EY, EY!" Roode says they have a lot of history together... Team Canada, former TNA World Tag Team Champions. He then says they had another battle last week. Both of them escaped the cage at the same time and now they will do battle again next week. They are doing it for the right reason. They are doing it for a shot at the TNA World Championship. Roode has to be at his best. He needs to bring his A game. He will have to earn it against EY. There&apos;s no one he respects more than EY and it will be an honor to be in that ring with him next week. EY gets on the mic and says he appreciates the respect. It means a lot. He says EY defending the belt every single week. He was the fans&apos; Champion. EY says it could have gone either way last week but fate has put them here. Their match will happen next week. EY has done hundreds of interviews and everyone always asks him, "Who is the best wrestler today?" EY says his answer is Bobby Roode and it will be now, tomorrow, next week, and forever as long as he is in the business. Now, if people ask EY if he is as good as Roode... damn right he is! EY would only share the ring with Roode, but next week, he will be better than Roode. Roode gets back on the mic and says they need to give it everything they got and tear the roof off of the place! They shake hands and EY leaves the ring. The BroMans are backstage. Jessie and Robbie are on their phones while DJ Z watches them. Jeremy Borash walks over and asks if they are online dating. DJ Z explains it is a game about who has the most. DJ says it that time is up and looks at their phones. He says they are tied. Robbie and Jessie says they hit up a TNA Knockout. They will take her home. Who is it? They are trying to one up each other. Ethan Carter III&apos;s music plays and he walks out on the stage. He comes down the ramp with Rockstar Spud behind him. They get in the ring. Rhino&apos;s music hits and he runs right to the ring. Ethan stomps on him right away. Rhino stands and Ethan whips him in the ropes but Rhino attacks him as he comes back. They go to the outside and Rhino throws Ethan into the steel guard rail and then smashes him face first into it. He rolls him back in the ring. Ethan goes for a punch but Rhino punches him and goes to whip him in the corner but Ethan reverses it and then hits him with a closeline. Ethan covers but Rhino kicks out. Ethan takes Rhino to the corner, smashes his head into the top turnbuckle, and then stomps on him. Ethan chokes Rhino on the middle rope. He stomps on him. Ethan then drops an elbow and covers but Rhino kicks out. Ethan smashes Rhino&apos;s face into the mat several times. Ethan continues the attack with punches to the face. Rhino tries to fight back but Ethan knocks him down as he pounds on his back. Ethan whips Rhino in the ropes and then hits the Carter Closeline. Rhino goes down and Ethan covers but Rhino kicks out. James Storm comes out as his music plays. Storm squats on the apron with a microphone in his hand. He introduces himself as such a great figure and then introduces The Great Sanada! He comes out with face paint on like The Great Muta. Austin Aries comes out next. They move around the ring. They lock-up and Sanada quickly works on the arm but Sanada reverses it. Austin does several arm drags and then a quick pin but Sanada kicks out. Aries quickly applies the Last Chancellory. Sanada gets the rope break. Aries gets up and lays across the turnbuckle. Sanada stands and looks at Storm. He then bows to him. Sanada turns and he and Aries walk around and then lock-up. Sanada puts Aries in the ropes and then punches and chokes him with his knee. Sanada punches Aries in the face and puts him in the corner. He does several knife edge chops and then whips him in the ropes and does another huge chop. Sanada chokes Aries on the mat. He doesn&apos;t let go but finally does right before he is disqualified. Sanada gets Aries up and does a backbreaker... another backbreaker... and then a body slam. He covers but Aries kicks out. He does another but Austin kicks out again. Sanada applies a headlock but Aries gets up and elbows his way out. He punches Sanada in the head and whips him in the ropes. Sanada flips over them and lands on the apron. Aries takes Sanada to corner to corner back and forth. He then hits a shoulder block and then a neck breaker through the middle rope. He then hits a suicide dive. A video package plays showing Chris Melendez and how he fought for the United States of America in Iraq. He was involved in a car explosion that made him lose his leg. He loves wrestling and trained to become a professional wrestler. He is now part of TNA Wrestling. Don&apos;t give up. Keep on pushing. Kurt Angle is in the ring with a microphone. Mr. Anderson, Bully Ray and Devon are behind him. Kurt introduces us to Chris Melendez. Chris&apos; music plays and he comes out on the stage. He walks down the ramp and gets in the ring. He hugs Devon and then shakes Kurt&apos;s hand. He shakes Ken&apos;s hand as well as Ray&apos;s and then hugs him. The crowd chants, "USA, USA, USA!" Kurt says he knows about sacrifice as he did that all his life, but that is nothing what Chris did for this country. The crowd chants, "Thank you Chris, Thank you Chris!" Kurt says he is a survivor. He is an amputee. He is also a member of the Impact Wrestling family. Anderson grabs the mic. He says he was used to be part of the army and one of his favorite charities is the Wounded Warriors. Ken gets a call from someone mentioning Chris. He got a picture of Chris and the person asks if he can train Chris. He doesn&apos;t have a ring though. He knows who does though. That&apos;s team 3D. He hands the mic to Ray. Ray saw the video of Chris and met up with him. He says they will train Chris for free. Ray states this is one of the proudest moments of their career. Devon grabs the mic and welcomes Sgt Chris Melendez! Ray and Devon raise Chris&apos; arms. The talent hug and shake Chris&apos; hand again. The crowd stands and claps in appreciation. Ray and Devon are in the ring. Music hits and here comes The Hardys. They make their way to the ring. The Wolves come out next. They have the TNA World Tag Team Championships around their waists. Eddie starts the match against Bully Ray and he quickly tags Davey. He enters and goes after Bully but he tags Eddie again. Eddie enters and attacks Ray&apos;s arm some more. He tags Davey. Davey enters but Ray catches him and puts him in the corner. He does a huge knife edge chop to Davey&apos;s chest. He does it again. Davey stands. Ray does another chop but Davey kicks him with a series of kicks. He goes in the ropes but Ray does a body slam. He goes for "What&apos;s Up" as Ray tags Devon. He climbs the corner but Eddie kicks Devon in the corner. Davey goes after Ray and does a cover but Ray kicks out. The Hardys enter and they go after The Wolves. Matt gets on his hands and knees and Jeff goes after Eddie and then after Davey but Davey closelines Jeff down. Team 3D comes in and Ray does a back suplex to Davey while Devon hits a neck breaker. Devon covers Davey but he kicks out. Matt tags in and goes after Davey. He then tags Jeff. They toss Davey in the corner and he falls. Jeff covers but Davey kicks out. Jeff does a snapmare and then a low dropkick. He covers but Davey kicks out. He tags Matt. Matt jumps from the corner onto Davey&apos;s arm. Matt continues the attack and then goes for a suplex but Davey does a roll-up. Matt kicks out. He hits him with a Side Effect. He covers but Devon saves the match. Davey stands and Devon and Matt run to him but the hit each other. both go down. Eddie enters as he tags in and goes after Devon. He takes Jeff down from the corner. Matt goes after Eddie though. Jeff enters and attacks Eddie. The Hardys and The Wolves are in the ring. They go back and forth but The Wolves go in the ropes and take out Team 3D on the outside. Matt then gets on his hands and knees as Jeff jumps on him and flies. He takes out The Wolves. The Wolves and Team 3D stand. Matt climbs the corner and hits the moonsault. Matt rolls Eddie in. He covers but Eddie kicks out.